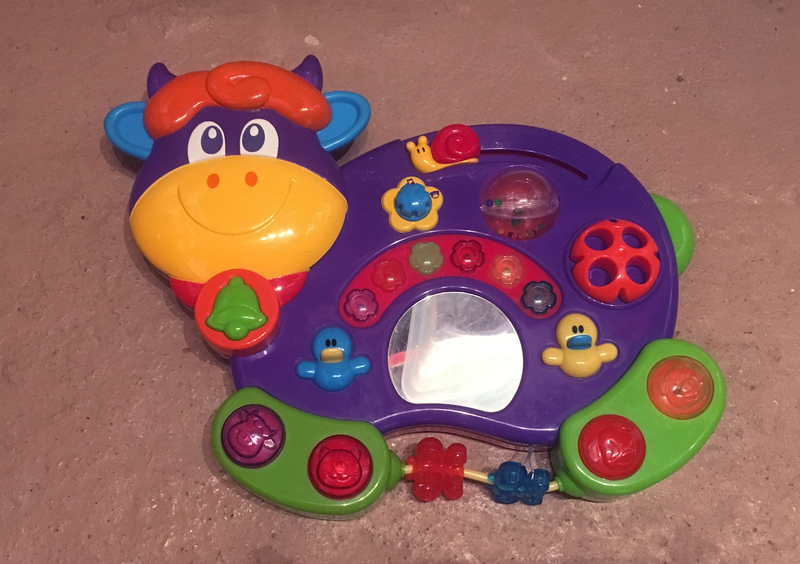 Having just finished a couple of projects designed for automatic control via the Bigfoot sequencer, I was looking for a similar toy that could be played manually. The Blue Cow seemed to be exactly the kind of thing I was looking for. which could be worked on with a combination of modification and circuit-bending. 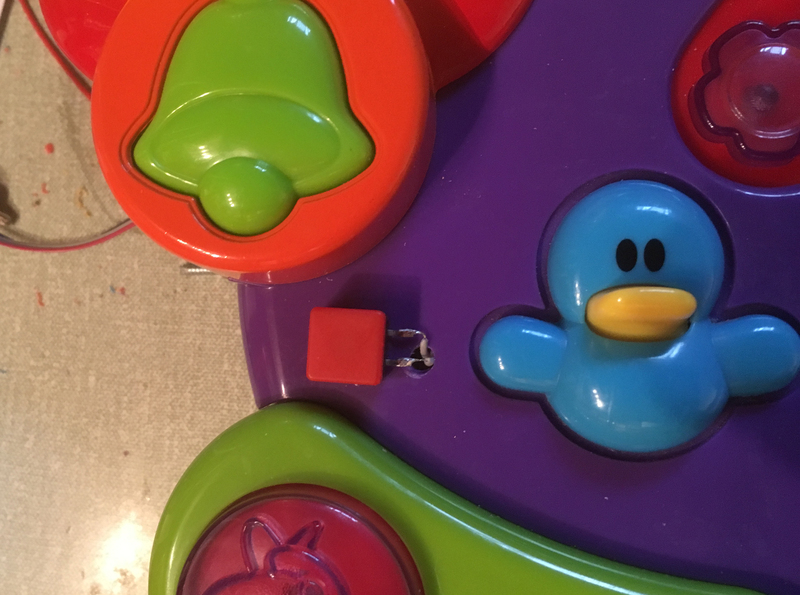 There are buttons which make the sounds of a cow, cowbell, cat, dog and pig; two switches – the ducks’ beaks – which play a short musical sequence and light up the 6 LEDs; and three mechanical controls. One, a snail which moves slowly across the cow’s back, makes no electronic sound, but there are two others which do: a rotating ball which makes the cowbell sound as it turns, and a rotating control with finger-holes, which moves the cow’s tail and plays a tune with a bell-like tone. I opened the back of the device and took a close look at the PCB inside. The first thing I noticed was an extra switch which hadn’t been used. It had the word ‘sheep’ next to it, so I eagerly connected a pair of wires to it and, sure enough, a baa emerged. So the first thing I did was add an extra switch on the front of the cow to produce this new sound. After that I searched for the resistor which would affect the pitch of the sounds. It took a while, but I found it, removed it from the board, and attached two wires in its place, running to a potentiometer so that the pitch could be varied. In this view of the circuit board 1 indicates the previously unused switch, and 2 indicates the position of the pitch/timing resistor. The wires now connected to these two sections are on the underside of the board. 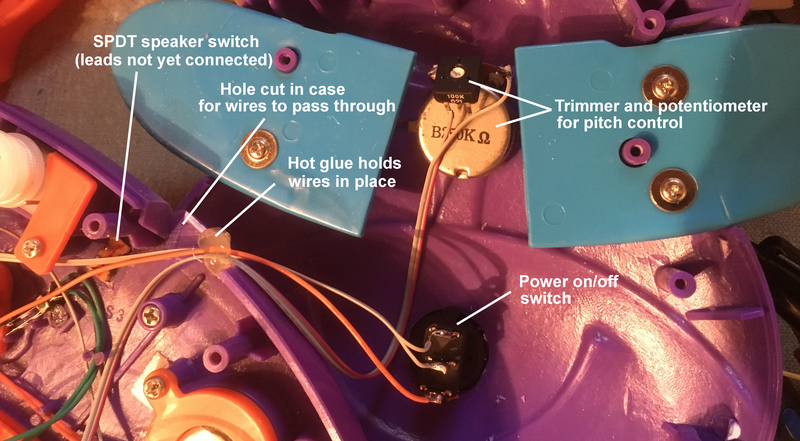 It took a little experimentation to find the correct value for the potentiometer, to ensure sufficient pitch variation, but not to increase or decrease the resistance so much that the device crashed. This is the normal thing when replacing a timing resistor. In this case, a 250k potentiometer was the best value, with a 100k trimmer to adjust the minimum resistance. 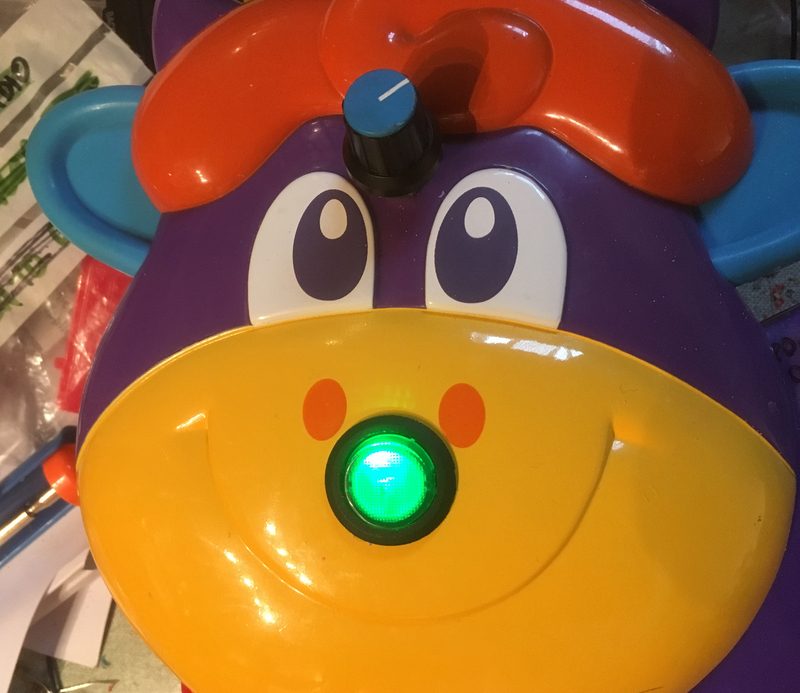 The potentiometer went on the front of the cow. 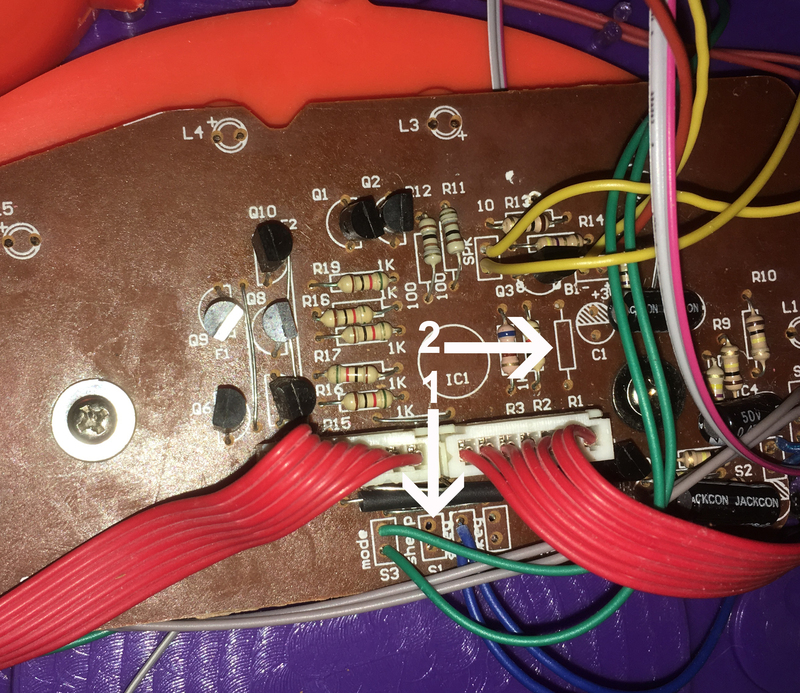 I unscrewed the sections behind the 4 main sound buttons, and checked the additional circuit boards which were connected to the main board by a series of red wires. There were 14 of these these wires, which went directly to the sound-producing chip. Some of these wires went to LEDs beneath the buttons, so I tested the others by connecting them in pairs, and found various combinations which would produce almost all available the sounds, including the newly-discovered sheep. 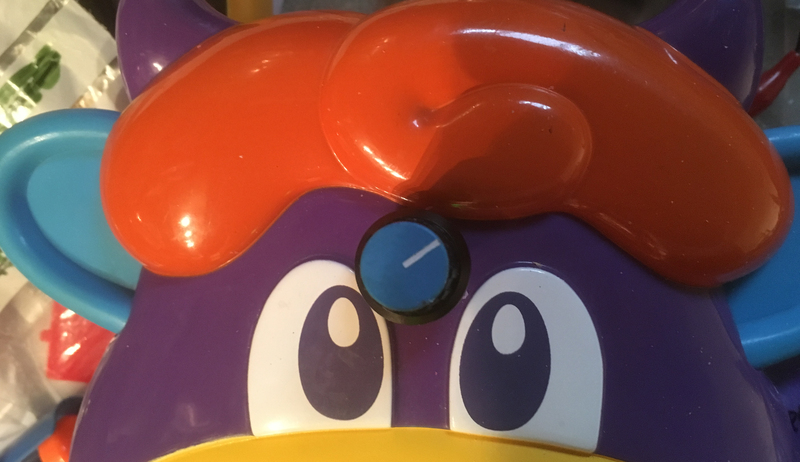 If I included one of the connections of the switches under the ducks’ beaks, all the sounds were available, and I began thinking of extra ways to access them. First of all I added four tilt switches, so different sounds would be produced as the device was moved around. These were a simple and cheap type – about 10p each – but very effective. 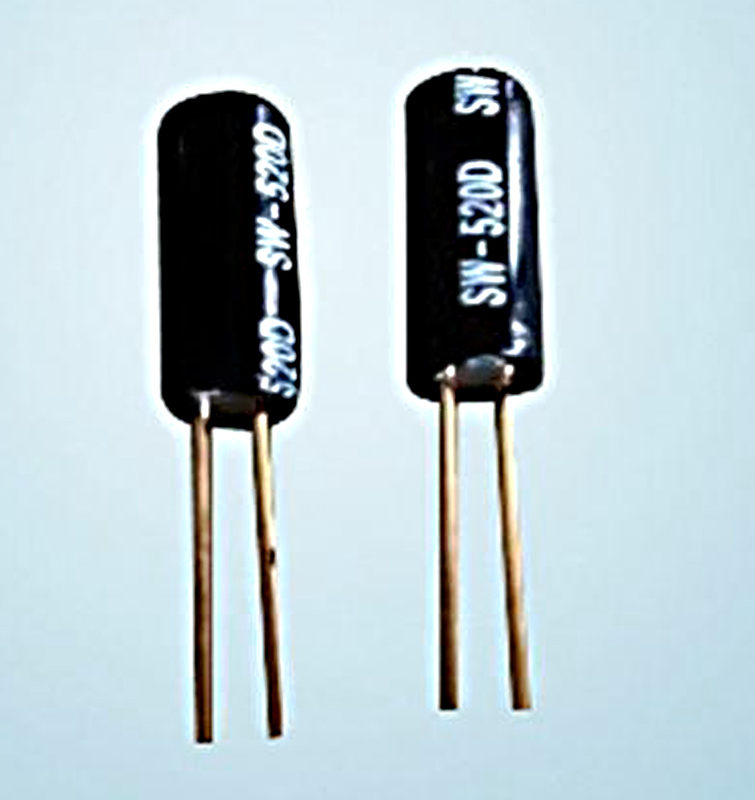 Constructed in a small can with two legs, not unlike an electrolytic capacitor in appearance, an internal connection is made when the can is tipped from horizontal to vertical. I glued the switches inside, left, right, top and bottom, with a different sound connected to each. The arrows in the following picture indicate two of the switches in situ. 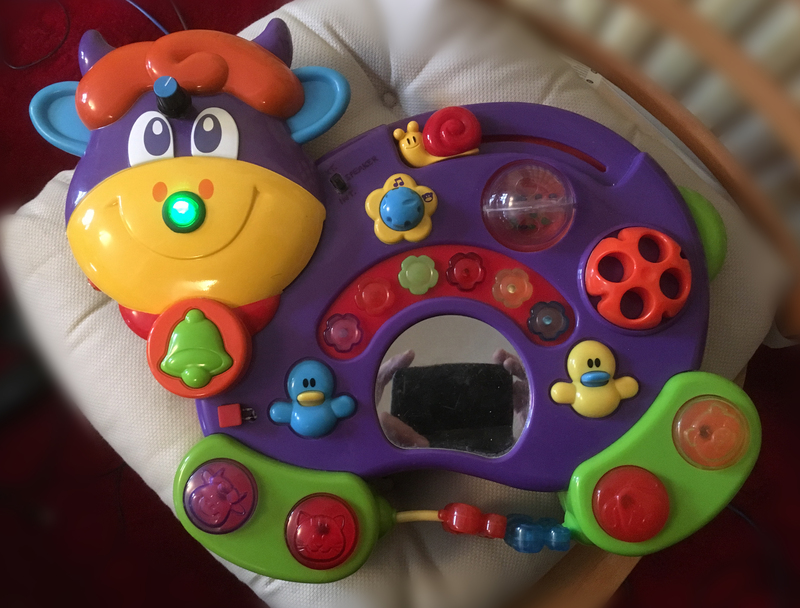 One awkward thing about the circuit – especially with the tilt switches in place – was that there was no on/off switch: the power was on – and the device ready to make noises – as soon as batteries were inserted. The odd thing about it, as an SPST, is that it has 3 contacts. It took me some time to work out, but its normal function is to switch +v from one outside contact to the centre; the other outside contact – not connected to the switch – is for a 0v connection to the internal LED. In this case, the power lead from the batteries connects to the ‘off’ side of the switch, the lead to the circuit board connects to the centre, and the 0v lead connects to the ‘on’ side of the switch. 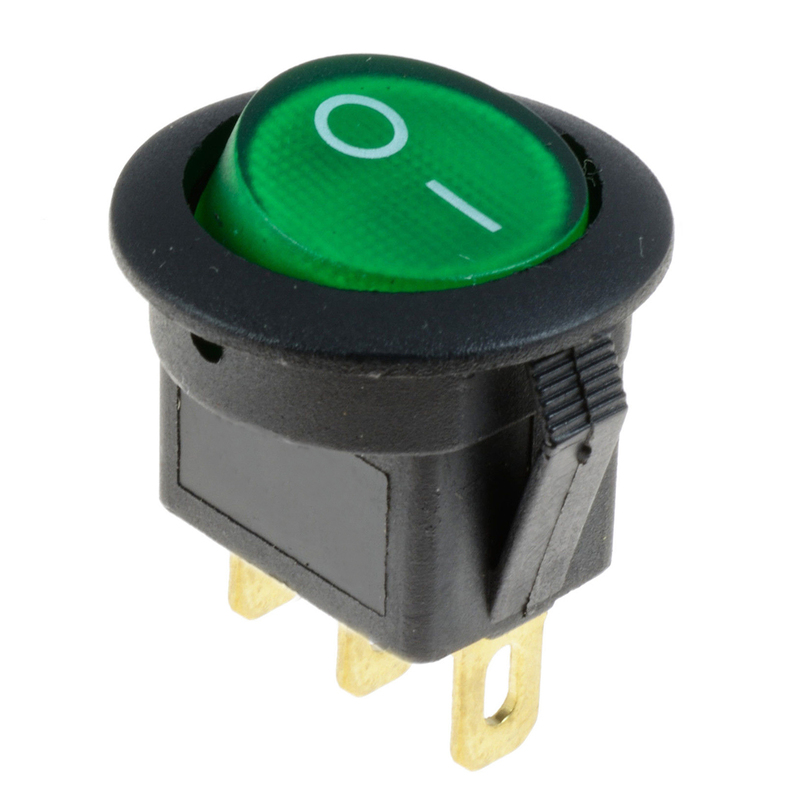 In this way, when the switch is turned to the ‘on’ position, power is connected to the circuit board and the switch lights up – very attractive! I liked these switches so much, I bought several of them at about 30p each. 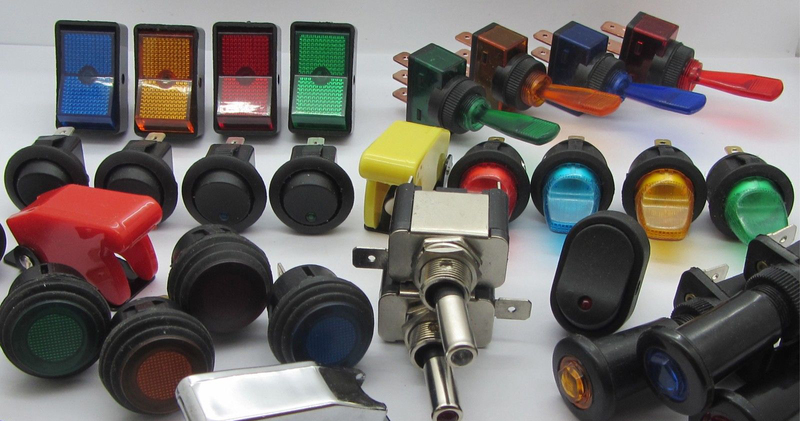 They were labelled as suitable for 12v – their origin is for use in the automotive industry – but lit up fine from the Blue Cow’s 4.5v. although I always find these more difficult to mount than round ones. The one on the right looks interesting, as it’s a centre off with a latching switch one way and a momentary switch the other. At this time I also added a small SPDT switch to change the output from the small internal speaker to 4mm external speaker sockets or to an audio out socket. In the following picture 1 = the internal/external speaker select switch; 2 = the speaker select switch inside; 3 = the external speaker sockets; 4 = the audio out socket. Here’s a short demo of the Blue Cow. In this case it was connected to an external speaker and the sound recorded via microphones.